In 1915 ladies carried 100 feet of signatures petitioning Congress for the vote. Today we just make a few clicks on our phones and tablets. “US Congresswoman Jackie Speier has nominated Ms. Milholland for the Presidential Citizens Medal, the second highest civilian award of the nation. The National Women’s History Project, an organization that celebrates the diverse and historic accomplishments of American women, would like you to join Congresswoman Speier in urging President Obama to award this amazing woman with one of America’s highest honors. During her short life, Inez fought for equality for all. As one of New York state’s only female lawyers at a time when few women practiced law, she was an advocate for racial justice and a champion for prisoners’ and workers’ rights. But it was her fight for women’s suffrage that made her a true American hero. Between 1910 and 1916, she became a central figure in the drive for Votes for Women in New York State and throughout the country, chairing meetings, answering opponents’ arguments, lobbying state legislators, and leading suffrage parades up Fifth Avenue. 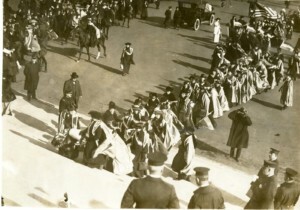 In march 1913 Inez led thousands of women suffrage activists in a parade in the nation’s capitol. She died on the campaign trail in 1916. Because of Inez Milholland Boissevain’s work, and the persistence of tens of thousands of American suffragists from 1848 to 1920, the 19th Amendment to the U.S. Constitution was passed to ensure women’s voting rights now and for future generations. 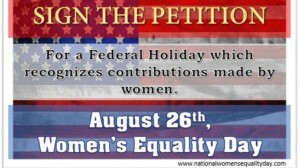 It’s time we bring recognition to someone who gave everything to win these crucial rights for her fellow Americans. 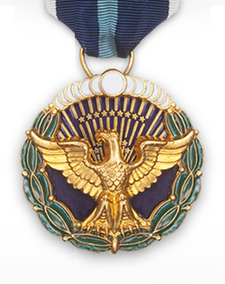 Please join us in petitioning President Obama to award Inez Milholland the Presidential Citizens Medal. 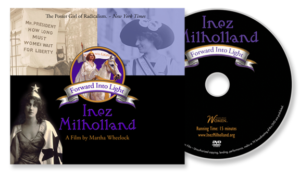 Documentary short, Inez Milholland ~ Forward into Light released. 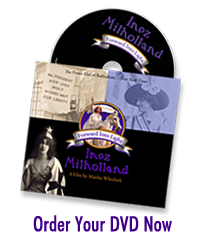 This documentary tells the story of American icon, Inez Milholland who broke convention with her striking conscience advocating for gender equality, pacifism, racial justice, unions and free speech in the early Twentieth Century. She became the voice of suffrage. Inspired by the Southern Poverty Law Center’s production and free distribution of “Selma,” filmmaker, Martha Wheelock made the decision to make a film about Inez Milholland, American Suffragist who lost her life while campaigning across the West for federal suffrage. With the shockingly low numbers of Americans voting, Martha wants women and girls to understand the cost and importance of the vote. How better than tell the story of Inez Milholland, astounding woman who gave her life for the 19th Amendment? 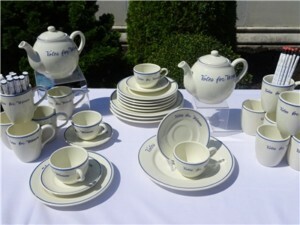 Associate Producers: Peg Yorkin, Virginia Carter, Judith Osmer, Joan Smiles. 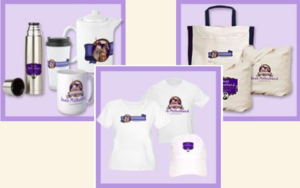 A project of the National Women’s History Project and Wild West Women, inc.
Who is that Lady on the White Horse? Most know this famous rider but don’t know her name: Inez Milholland. Very few know her story. She was American Amazon who broke convention with her striking conscience. She was an advocate for gender equality, pacifism, racial justice, unions and free speech. Her dedication was emboldened with a degree from Vassar, NYU Law Degree and admission to the New York Bar. She captured headlines and mesmerized audiences as she proved that voting rights appealed, not just to “brainy women,” but to all women, “ladies” and beauties as well. 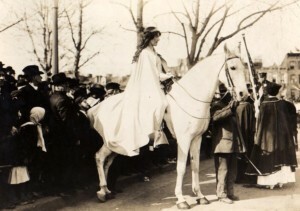 Most famously, she led the 1913 Suffrage Parade on her horse, Gray Dawn; risking all as she rode directly into the masses of violent disapproving men. White cape, gloves and a crown, Inez became the Suffrage Movement’s very own Joan of Arc, the national iconic figure for VOTES FOR WOMEN. Overcoming her insecurity of public speaking, she evolved into the voice of suffrage. In 1916, at the request of the National Woman’s Party, Inez traveled across the country, giving 50 speeches in 28 days through nine Western states where women COULD vote. . Never complaining, never hesitating, she collected herself, and rose to speak again and again. Fighting through exhaustion, anemia, severe dental infections and persistent tonsillitis, she fell at the podium October 23,1916 at Blanchard Hall in Los Angeles. Her last public sentence, “President Wilson, how long must women wait for liberty? With that emotional plea and clear statement, Inez fell from the podium, was taken to Good Samaritan Hospital where she died 30 days later. She was only 30 years old. The wait is over! Inez Milholland ~ Forward into Light is done. The dream started long ago. 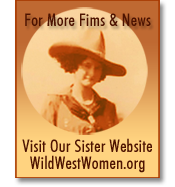 Filmmaker, Martha Wheelock loved Inez Milholland and wanted to tell Inez’s story to the women and girls of the U.S. It rose to the surface with the Centennial of Inez’s massive cross-country tour of 1916 and converged with the upcoming celebration of the Centennial of the 19th Amendment in 2020: Women’s right to vote. Inspiration caught Martha’s eye when the Southern Poverty Law Center made a short documentary, Selma: The Bridge to the Ballot. 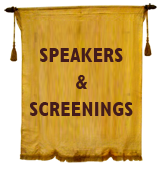 Their film celebrates the Voting Rights Act and is distributed for free. It is their call to cast the vote. 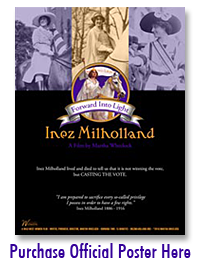 And now you can order Inez Milholland ~ Forward into Light for free. We hope you will show it to students, organizers, house-parties, everywhere voters meet. We want you to discover the heart and spirit of Inez and honor her memory with your precious vote.